In the story of an epic wartime journey whose source lies in the intimacy of a profound love, the novelist Candida Clark finds both humanity and wisdom. Anthony Minghellas latest cinematic epic is a great love story. As such, it is also a great anti-war story. The film is set during the American Civil War of 1861-65, but apart from early scenes  which vie with Saving Private Ryan for sheer realism  there are no battles, few explosions, no sense of war-plan or stratagem. Nor are there martyrs or heroes. Southern Honour barely makes an appearance and theres little question of a Lost Cause. Theres only the sorrow of death, the fact of love. This is of course deliberate, and the effect is to have created a potent argument against the impulse to war. Hold a magnifying-glass up to two people, torn apart against their will, as happens in this film, and you dont find much in the way of idealism or abstract theory. Theres just the pain of not being together, and the anger at unwilling separation. Cut them and they only bleed. History is not written or revealed in individual lives. Life is always personal, before and after everything else. Accordingly, it would be simple enough to criticise the film for being ahistorical. This film is not about the politics of race that were central to the civil war. 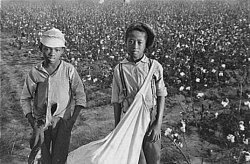 There are no black characters, only types, and those are voiceless: a drugged black woman, bearing a white pastors child; cotton-pickers, their backs turned with industry; unseen workers living in a shack, hidden by a scree of rain. But while it would be foolish to expect a history lesson from this film, nor will you find any attempt to rewrite what is already known, still less to gloss the facts with Southern glamour. Apparently more than 60,000 books have already been published on the civil war. Charles Fraziers novel, on which the film is based, isnt, strictly speaking, one of them. Neither Confederates nor Yankees are romanticised. Beyond good wardrobe, there are few Southern belle frocks and the uniforms are ill-fitting, dirty and dull, borrowed most often from dead men. This is not to say the film is altogether apolitical  far from it. The political sense underwrites the intention of every frame, the camera lingering in close-up on hands and faces, catching the edge and finish of a smile, the poignant mobility of expressiveness. Its an old technique, but a good one: focus sufficiently on the individual, observe them closely, flaws and all, and it becomes harder to group them under the umbrella of a single identity or cause. Were all born equal, but its the fact and freedom of being individual that carries the day. Honour is a dubious luxury, and a dangerous goal, flattening as it does so much personal experience and desire. While Minghellas film is in the mould of grand tragedy, executed on a human scale, its delicacy is heart-breaking, its commitment to the individual relentless. By the end, theres little sense of what might have been won and lost, theres only a shattering intimation of the cost in human grief and in time laid waste by suffering. This effect would hardly have been possible without the superb performances Minghella draws from his actors, all of whom seemed to have entered the roles of their lives. For a film so rich with a sense of landscape, its the faces and bodies that lodge in the mind. In fact, the landscape of Cold Mountain has an unreal quality. Characters move in close-up against a mythic backdrop of forests and far blue hills, a blank extravagance of snow. Or suddenly, lush with high summer, were in a meadow that could be almost anywhere  an Arcadian idyll, with the hero, Inman, resting on his plough, the heroine, Ada, passing by, playing the piano on the back of a cart. When war breaks out, Inman joins up as a Confederate soldier. Its bad timing: hes only just fallen in love. Often wounded, in the end a deserter, he sets out alone and on foot to get back to Cold Mountain and Ada, his beloved. Asked where hes bound, meaning also, what are his allegiances, he responds: Shes a place and Im heading to her. His desire to preserve himself, to stay alive, is on her account only. The question of returning to regain a land is barely asked. Theirs is the only union he cares for, or for which he is prepared to perish. Its not so much Gone with the Wind as the Odyssey, and from the start theres one transfixing tension: will Inman find his way back home? His journey is starred with deception and delay. Weather interrupts and scuppers. Footsteps in the snow lead villains to the kill. But dig deeper, the film seems to say, and there are benign guides with native wisdom willing to help. The ancient myths will save you in the end, if youll only listen to them. Nature, too, is friendly  once you get to know it. Left alone, with no knowledge of how to farm, Ada goes hungry. She has to learn about the land in order to live. Otherwise, the seasons endlessly conceal, outplaying the drama and violence of human action. Battles are fought in mud, the bodies heaped and cleared away, much like autumn leaves. This underlines the impression that to my mind is the key to the film: it is often unclear who is fighting whom, and to what end. There are no visible battle-lines. The so-called Home Guard, their remit local and specific, are more of a menace by far than the Yankee army. Any cry of victory is hearsay. The sense of there being a cause  on either side  is obscured by the physical fact of what being prepared to die for a cause amounts to: only death, banal and terrible. This all goes to re-emphasise the impression created by Anthony Minghellas earlier film of a book, Michael Ondaatjes The English Patient. In a way, Cold Mountain might almost be a companion-piece to the earlier film  a kind of ice to that films fire. The result is something Joseph Conrad hit upon a century earlier: travel to the heart of things and you dont find much in the way of heroism or ideals, only an ever-greater collection of shadows and ethical questions to which there can be no sole answer or solution. For both Cold Mountain and The English Patient eschew the notion of moral clarity. Theres only an ever-greater ambivalence  the receding sense that decisions and lives are by no means perfectible, nor are they moving towards anything like an ideal. Progress is merely a belief of the ill-informed. Was The English Patients hero, Count Almásy, a good man? Who knows, who can tell? It hardly matters. In both films, love is suddenness and necessity, an articulation of its power to disassemble. And running through both, is the anguish that comes of having a fully-functional moral sensibility, with neither rule book nor code of law, and not even a whiff of Honour to hide behind  which is just one of the things that makes both films so humane. Lateness is the hex under which Minghellas characters labour. If only Almásy had been able to return to the cave in time. If only Inman returned a day earlier  or later. Its a very modern hex: to have the ability to execute an idea almost before its fully realised, and yet still to miss the moment when it counts. Each wound equals a delay. The human body only heals so fast. You cant step into the same river twice, after all. In a world where so much happens at one remove, this film is a powerful reminder of the foolishness at play in the modern fantasy of death as abstract, and human life as a symptom of the hi-tech or precision-guided  when in fact, the same as ever, it is muddy, full of mistakes, liable to be brutal, never enough. Candida Clarks fourth novel, Ghost Music, is published in paperback on 4 February 2004. She appears on BBC Radio 4s Off the Page at 11pm on Friday 6 February.